Monpardiac is located in the Gers department in the Midi-Pyrénées region of South-West France. Surrounding the village there are stunning views, forests beyond and the Pyrénées mountain range in the distance – which all make for a spectacular setting when you rent a self-catering Monpardiac holiday cottage. The culture of Monpardiac and its neighbouring villages is a largely agricultural and tranquil way of living; the pace of life is seductively slow! Prepare yourself for a gastronomic feast! Local specialties include: Armagnac brandy, Côtes de Gascogne, Floc de Gascogne, foie gras, and wild mushrooms. It’s worth indulging in the local fare – it’s rumoured that this area has the longest life-expectancy in France! There is plenty to see and do in the surrounding area when you stay in a Monpardiac holiday chalet. Auch, the capital of the department, offers sights including the Musee des Jacobins and the Gothic Cathedrale Ste-Marie - one of the last cathedrals to be built in France. Another major town nearby is Condom – many tastings are on offer where you can discover what the difference is between Cognac and Armagnac. Don’t forget to visit the Musee de L'Armagnac too when you hire self-catering holiday accommodation in Monpardiac! There is also Larressingle to discover when you visit Monpardiac - a tiny fortified village which has retained much of its former charm. This particular region is still steeped in the bullfighting tradition and Vic-Fezensac attracts millions of visitors a year to its huge wooden arena. Nearby Marciac holds a well-established jazz festival every July and August – with regular concerts throughout the year. 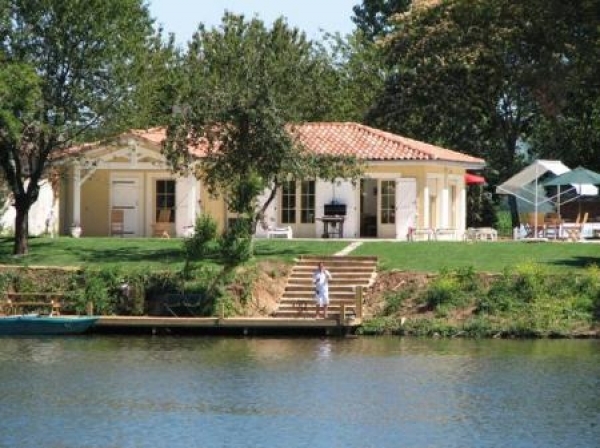 Travelling to your holiday rental cottages and chalets in Monpardiac, France; Scheduled flights with Air France and British Airways and low cost airlines easyJet and bmi baby operate from the UK to Toulouse: (then a 70 mile drive). Ryanair also provides services from Stansted to Carcassonne (100 mile drive). Pau is the nearest airport (a 50 mile drive). To Caen, Cherbourg or St Malo it’s a 500 mile drive. 36 hour ferry to Santander or Bilbao then a 200 mile drive. 'Le Shuttle' to Calais, then a 700 mile drive. The summers are very hot and dry in this department, the temperatures often exceeding 40°. Nearby Auch is one of the hottest cities of France, with often more than 300 sunny days in the year. The winters vary, with only occasional freezing temperatures, but the climate remains mild and dry, the department is one of sunniest in France.